As a child watching these specials back in the day, I found myself wanting to reach into my television screen and touch the characters. Even today, I find the Rankin/Bass characters much more "real" than traditional flat cartoons or the computer generated effects of today because they were made of actual dolls that were crafted for movement. I was a little surprised to discover recently that the models were not itty bitty figurines (which is the way they often appear on-screen) but good sized creations that can be handled by two adult hands. 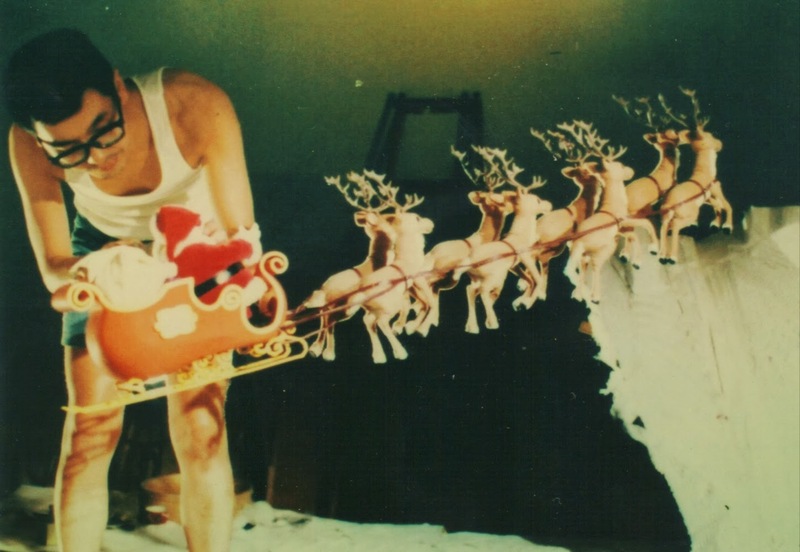 Take a look at this photo from Screen-Novelties which chronicled the restoration of the Santa and Rudolph puppets from the 1964 Rudolph the Red-Nosed Reindeer special. Santa has a big noggin! Paul Coker, Jr., who was an illustrator for Mad magazine, was the production designer at Rankin/Bass and (along with fellow illustrator Jack Davis) created many of the characters for the TV specials. The painstaking animation itself was done in Japan by stop-motion animator Tadahito Mochinaga. Rankin/Bass called its stop-motion animation technique "Animagic." I affectionately refer to it as "Herky-Jerky." 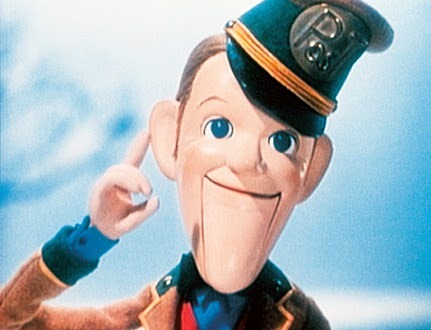 Either way, Rankin/Bass animation has become so iconic that it's been copied on Saturday Night Live, Denis Leary's Merry F#%$in' Christmas, and in the TV commercials of a local furniture company. 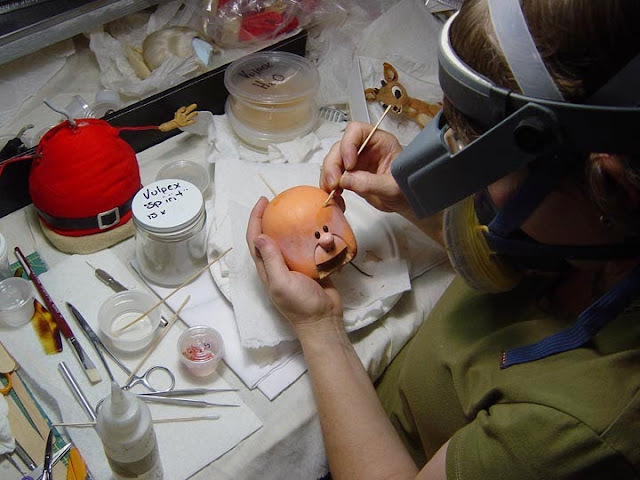 Sadly, a lot of the puppets/figurines used in Rankin/Bass specials no longer exist--they were often given away to employees and also covered with a spray that prevented them from reflecting during filming, which caused their already delicate, flexible body parts to break down. Jules Bass explained that while some recreations do exist, the average lifespan of a real Animagic figure was typically only 6 months. Perhaps the Santa and Rudolph shown above were recreations? And has any other production company given us more memorable characters than the Abominable Snowman, Hermey the Elf, The Heat Miser, the Burgermeister Meisterburger and countless others? In the foreword of a 2001 book about the production company, The Enchanted World of Rankin/Bass, Burl Ives said that the popularity of his Sam the Snowman character overshadowed his Oscar performance in The Big Country and his Big Daddy role in Cat On A Hot Tin Roof. On that note (no pun intended-ha!) every Rankin/Bass special had a soundtrack of catchy tunes. They were often written by Maury Laws, who composed the music and Jules Bass himself, responsible for the lyrics. To this day I remember the words and/or melodies to "the Heat Miser/Snow Miser song", "Silver and Gold", "When Christmas Day is Here", "Turn Back the Years", "Jingle Jangle Jingle" and "Put One Foot in Front of the Other." The Heat Miser song in particular has been so popular that it's been covered by rock and punk bands. Well, developed for children's programming, anyway. Did any of us know the "real" story behind Santa Claus, Baby New Year and Peter Cottontail before Rankin/Bass? Most stories often began with a narrator--looking exactly like the famous actor/celebrity voicing him. There also seemed to be an underlying message in many of the Rankin-Bass specials about accepting others who are different--how many of us felt sorry for Rudolph when the other reindeer wouldn't let him join in reindeer games due to his red nose? Or Hermey the Elf with his aspirations of dentistry? Or Nestor the donkey with his long ears? Or Baby New Year with his huge ears that everyone would laugh at? Likewise, I still get a bit misty eyed when I hear the toys on the Island of Misfit Toys sing about how much they want to be loved by a child on Christmas Day, but were outcasted to the island for being different. I've heard that some kids today can't really get into the old Rankin/Bass specials, and that's a shame. Perhaps the modern animation has them too dazzled, but I'll always appreciate the home runs that Rankin/Bass seemed to hit with every television production they created. This is interesting, because my coworker Steve (who is 54) was just telling me last week that his daughter had 'Rudolph' on dvd for her kids, and he thought that lessened the magic. He said "in the old days, we had ONE chance to see these shows, one night, one channel. It made them a lot more special." Thanks, Doug! It's funny you mention that these shows used to be available for one-time viewing only before VCRs were invented...because I wanted to write about that in a future post. Pam- As a kid I loved these Rankin Bass animated features, and they were always a central part of my Christmas experience. I especially loved Rudolf the Red Nosed Reindeer, and all the beloved characters in that special. Special is exactly what these features were, and Im glad they're still being shown, at least on cable. One more reason to love these is the way they championed individualism and nonconformity which is present in all of these features. The characters and plot all give a lesson on being who you are and not what others would have you be. 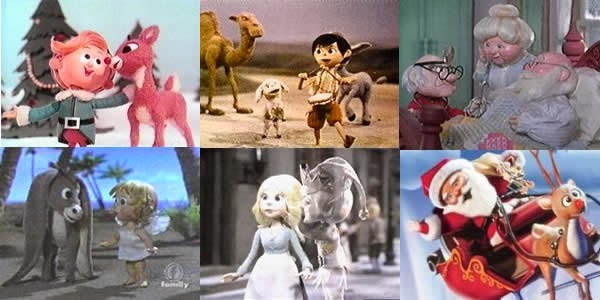 I first saw the Rudolph special in 1966 when I was 5, and the whole concept of the Island of Misfit Toys stayed with me to this day. I was one of them. And the music, written mostly by Johnny Marks, were some of the best Xmas tunes ever! Why can't people write good Xmas songs anymore? And don't forget that fun commercial with Santa riding the Norelco Razor!!!! Pam, on the spot; these are beloved. Anonymous is right on that Remington Santa - we always looked for it as well. An awesome post - thanks for the memories! I used to watch "The Little Drummer Boy" every year and cried each and every time.